On 11th April 2017, Perbanas Institute signed a memorandum of understanding (MOU) with the Korea Federation of Banks that will work towards the provision of a scholarship donation programme. The Korea Federation of Banks is a member of the South Korean National Banking Association as well as a strategic partner of the Indonesian Banks’ Association hence illustrating its key position to assist Perbanas Institute in becoming a top 5 Asian Banker’s Centre of Excellence. The visit by the Korea Federation of Banks is part of the Indonesia-Korea Financial Cooperation Forum held on 12th April 2017 in cooperation with the Indonesian Financial Services Authority as well as a wide-range of financial institutions. The MOU was signed by Dr. Wiwiek Prihandini, M.M., Ak., CA. 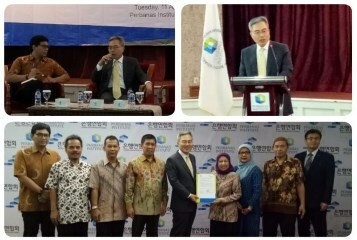 as Vice-Rector of Academic Affairs and Finance at Perbanas Institute and Mr Yung-Ku Ha as Chairman and CEO of the Korea Federation of Banks at Perbanas’ Auditorium Unit III building in Jakarta. By making available the scholarship donation programme, Perbanas Institute and its partner are looking to improve upon the quality of human capital involved in the finance and banking sector, in particular, lecturers and enrolled students of Perbanas Institute. The initiative would, therefore, include educational and training benefits to further hone in on the already strong skillset of Perbanas Institute’s faculty members. During the event, attendees also had the opportunity to gain additional information regarding South Korea’s higher education system as a form of knowledge sharing; a discussion session regarding the scholarship programme was also held following the MOU signing event. As a leading higher education institution, renowned for its banking, finance, and information technology programmes, Perbanas Institute is steadfast in anticipating potential barriers that can impose a significant impact to Indonesia’s banking and finance sector. Through its latest MOU signing, Perbanas Institute has thus demonstrated its far-reaching network of partners in addition to its capacity to push for the maturity of the national banking industry.